On Monday, 16th July the Pattaya Golf Society travelled to Pattana to play a stableford competition on the B and C nines. The course was in excellent condition and for the competition the white tees were used. This makes the course very long and it always gives the lower handicappers a nose start. However it gives the golfers the challenge they all seek at sometime in the month and makes for a tense competition. So it turned out, the longer hitters in the field all found themselves near the top with Masashi Iizumi continuing his good run with a well crafted 31 points to share third place with Icelander Kerry Jonsson, playing his first golf with the group in almost ten years. In second place with 34 points was Wichai Tananusorn and the winner was Fred Land, in the frame again, with 35 points. Wichai also recorded the only birdie ‘2’ of the day, on the long B7. The Booby Bevy went to Paul Brett for the day’s lowest score and he also benefitted from Rabbi’s free beer draw. Some guys have all the luck! But it takes more than luck to win at Pattana off the white tees so well done Fred! 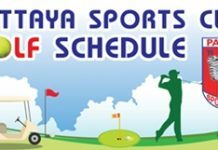 On Wednesday, 18th July the Pattaya Golf Society went to St Andrew’s to play a stableford competition on the course which was in excellent condition with slowish greens as the only downside. As with many courses, accuracy off the tee is the secret to a good round and the straighter hitters inevitably filled the places with Dave Edwards again coming good after an erratic week to start the month and posting 33 points with a third place finish on his first visit to the track. One point ahead on 34 was Leroy Blasi again savouring every inch of what is becoming a favourite course for him. The winner was the canny Aussie Robbie Taylor who managed to beguile the course out of 37 points for an emphatic win. He also recorded the only birdie ‘2’ of the day, on the fifth. Kerry Jonsson was running hot after nine holes with 22 points under his belt but the wheels came off on the back nine to give him the Booby Bevy for the largest split and Fred Land took Rabbi’s free beer draw back at the presentation in Soi Buakhao. The Pattaya Golf Society travelled to Crystal Bay on Friday, 20th July to play a stableford competition on the popular course, under brooding skies and with the occasional distant rumble of thunder, but the day stayed cool and dry after the first hole, making for a good competition on the B and C nines. All the usual suspects were there and great things were expected of the straight hitters in the field. Well then, how did Rabbi and Mr Len manage a share of third place with Dave Edwards? They applied themselves well throughout, that’s how, with Rabbi recording his best of the year, and they both recorded 35 points to join the current form man at the Elephant Bar in third. In second place was Masanori Takano with a well crafted 36 points, leaving the winner Ken Grimes well ahead on forty points. A week in Bali has obviously left him on a Bali High! There were no birdie ‘2’s and the Booby Bevy went to Robbie Taylor after his valiant efforts to avoid “hero-to-zero” status met with no success. The Boss’s free beer draw was enjoyed by Kerry Jonsson, a rare moment of satisfaction for the Icelander after a tough day at Crystal Bay.